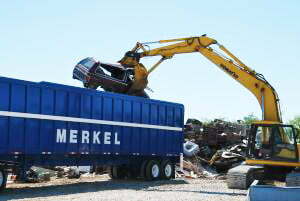 Merkel Metal Recycling Division is the leading scrap metal recycling center in Northeast Missouri. We are a full service center that provides purchasing, sorting, processing, marketing, and trucking of scrap metal for industrial, commercial, and residential customers. We take pride in building our business on honesty and integrity, with the utmost commitment to our customers, and a level of expertise which enables us to meet the needs of our industrial and commercial accounts. 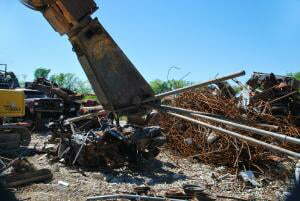 Merkel Metal Recycling Division currently services hundreds of customers within a 100 mile radius of Palmyra, Missouri. This includes northeast Missouri, west-central Illinois and southeast Iowa. With our team of highly skilled, trained, and competent employees we maintain a strong commitment to our customer's satisfaction, while delivering a high level of confident and professional service. Merkel Metal Recycling Division is dedicated to accessing each particular job and/or customer's needs and completing the job in a timely manner to best serve you, the customer. With our innovative equipment and our many resources, we are able to serve the customer’s needs at their locations, whether it be the removal of large amounts of scrap metal or large single items not feasible for transportation as a whole. With our variety of scales, we have the ability to meet the demand of the general-public whether it is 5 lbs. of aluminum cans or a 20 ton semi-trailer load. Merkel is a buyer of all Ferrous and Non-Ferrous metals. Prepared form and unprepared form.